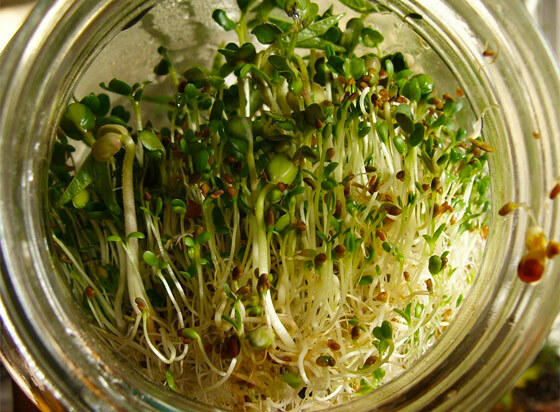 Sprouts are seeds that have been provoked out of dormancy and are on their way to becoming plants. Sprouting is an outcome of germination—a technique that gardeners and farmers use to prepare viable plants. By giving a seed an environment rich in water, oxygen, and warmth, the embryo inside hopefully decides that it is time to grow up. Germination has the added bonus of making the newly-formed sprout richer in nutrients than the seed alone had been. Nutrition, digestability, and taste are why sprouts have long been considered a healthy addition to meals. Note, however, that not all sprouts are created equal—protein and vitamin content depends on plant variety. Sprouted seeds and grains have been steadily rising in popularity over the last few years. If you have been to a natural foods store recently, you’ve probably seen bread and granola with sprouted wheat, tortillas with sprouted corn, and soup with sprouted lentils. The media is beginning to notice. As producers have caught on to this, they have unleashed a torrent of sprouted foods. At Whole Foods alone, there are sprouted versions of breads, quinoa, lentils and granola. None of this is surprising for Whole Foods, known for its organic foods selection. But more mainstream chains are offering sprouted foods, too. The natural Asian food brand Annie Chun’s says sales of its microwavable sprouted brown rice, which is sold in large chains like Safeway, Kroger and Wegmans, grew by more than 24 percent last year. “I think we’re just at the cusp of people starting to understand what that product is and why it’s a better choice,” says Diana Wang, marketing director for Annie Chun’s. Aside from showing up on grocery store shelves, sprouts are also showing up at home. A coworker and acquaintance whom I occasionally get coffee with likes to sprout lentils and eat them as a healthy snack. All you need is a glass jar, some water, a rubber band, and a thin, porous cloth such as cheesecloth. There are directions for doing this scattered throughout the web.